The Fujitsu fi-6110C scanner's small footprint and advanced feature set make it an ideal solution for decentralized scanning environments. With its true, 600-dpi optical resolution and dual CCD cameras, it captures your documents' finest details in color, grayscale, and monochrome. 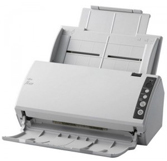 What's more, it shares much of the advanced technology found in higher-end scanners, including a 50-sheet automatic document feeder (ADF) that accommodates a wide range of document sizes (2.1 in. x 2.9 in. to 8.5 in. x 14 in. ), ultrasonic double-feed detection for greater security, and a Carrier Sheet function for feeding fragile or oversized (A3) documents. Plus at speeds up to 20 ppm (simplex) / 40 ipm (duplex) it quickly and efficiently transforms your paper documents into more manageable digital files. Adobe® Acrobat® Standard and ScandAll PRO utilities are included with the Fujitsu fi-6110C scanner, which allow you to quickly and easily integrate it into your workflow. 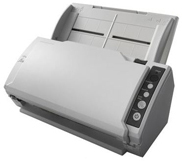 The fi-6110 scanner's design includes advanced technology found in high-end scanners, including high-speed USB 2.0 connectivity, a 50-sheet automatic document feeder (ADF) that accommodates a wide range of document sizes (2.1 in. x 2.9 in. to 8.5 in. x 14 in. ), and double-feed detection for reliable scanning. Plus at speeds up to 20 ppm (simplex) / 40 ipm (duplex) it quickly and efficiently transforms your paper documents into more manageable digital files. Adobe® Acrobat® Standard and ScandAll Pro are included with the Fujitsu fi-6110 scanner, which allow you to quickly and easily integrate your workflow. Physical dimensions 11.5 x 5.6 x 5.1 "